There's nothing more comfortable or versatile than a t-shirt that fits well -- that's why we bring to you the 10 best t shirt brands in India for men and women. Get a nice number from popular t shirt companies for your spring/summer wardrobe and pair it with your favourite lowers and accessories (jeans + watches for men; and skirts + bracelets, leggings + neck pieces, shorts + anklets for women are just a few cool combinations.) 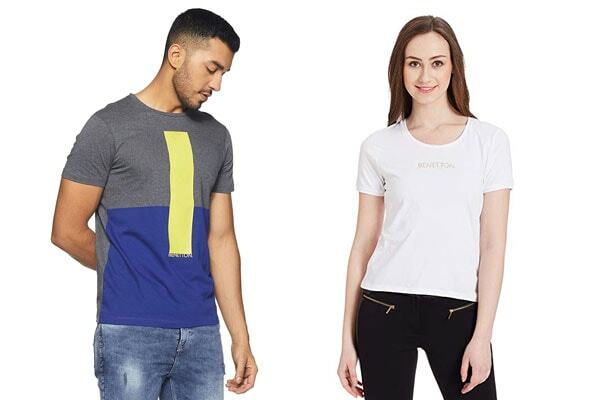 Ahead, whether your preference is plain or graphic, the 10 best t shirt brands in India for men and women to buy on Amazon. We've segregated the haul to make it easy for you. Scroll down and order from popular t shirt companies now -- for yourself, for your friends, your lovers, or your family. 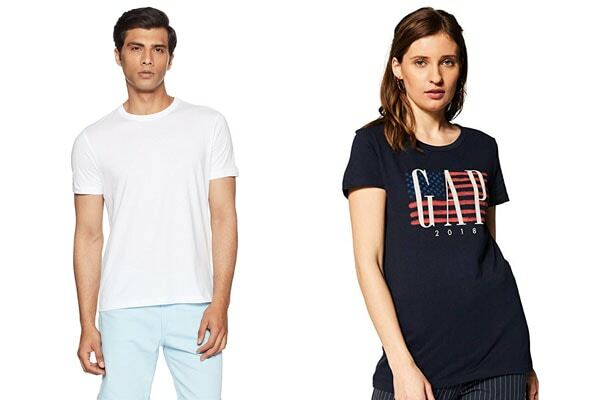 Founded in 1969, GAP, an American worldwide clothing and accessories retailer, is one of the best t shirt brands in India first popularised by Shah Rukh Khan (remember the orange shirt he wore in Kuch Kuch Hota Hai?) For men, we recommend this super-versatile 100% cotton plain white tee, and for women, the 100% cotton slim fit navy tee. If you like quirky clothing, then homegrown Tantra founded by Indian businessman Rajiv Ramchandani is one of the best t shirt brands in India for you. 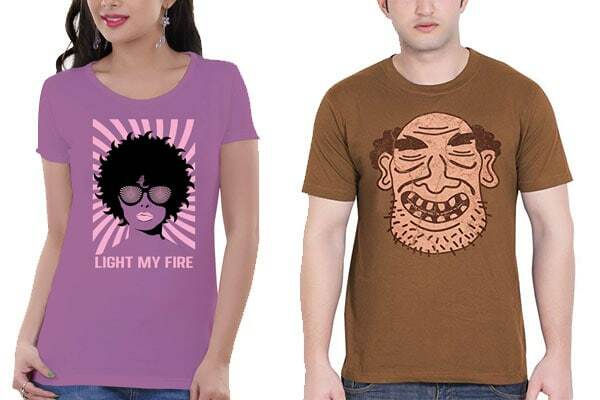 Check out this 100% cotton purple Light My Fire t-shirt for women, and this 100% cotton beige/red caveman shirt for wild men. 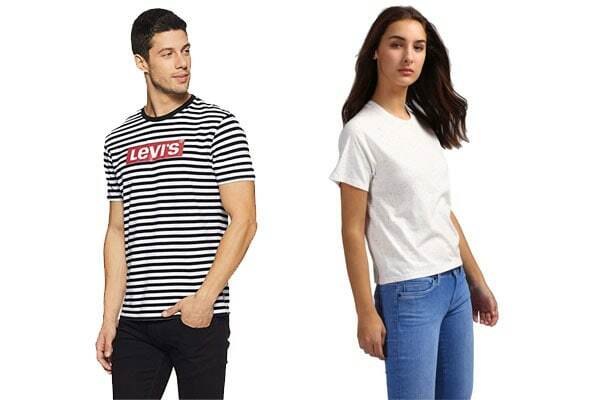 Levi's is not only the market leader in jeans, but also happens to be among the best t shirt brands in India with a mindboggling array of t-shirts to choose from. 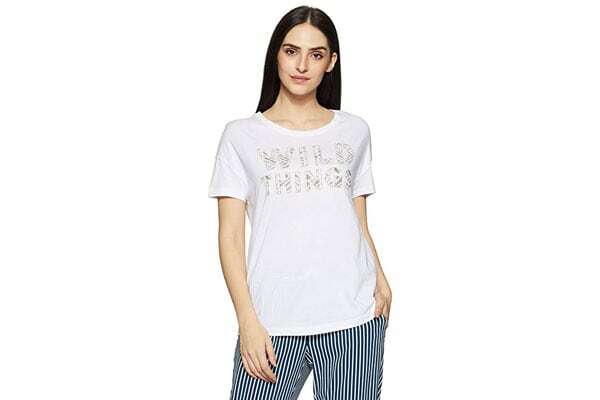 Men who want a fun wardrobe should get this striped black-and-white tee with a red emblazoned logo, and women can opt for this super-cute 100% cotton plain white speckled tee. A lifestyle brand founded in 1985, Tommy Hilfiger is also one of the best t shirt brands in India that has shaped street style world over. Women can opt for the Tommy Jeans t shirt in Rumba Red, and men who like basketball can opt for this popping-blue graphic t shirt. Of German origin, Adidas is a multinational best known for its sportswear. 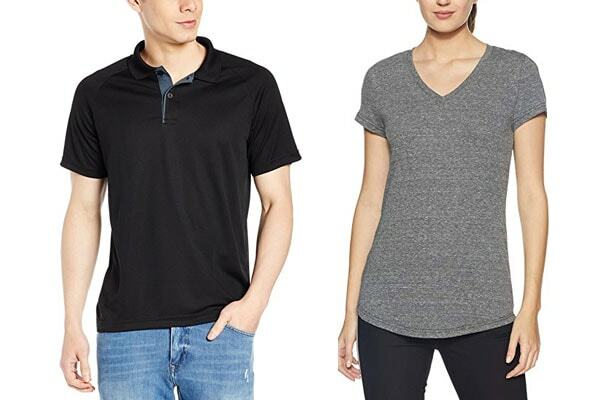 It's also one of the best t shirt brands in India -- women can get the Adidas Women's Plain Regular Fit T-Shirt (63% Viscose, 35% polyester and 2% cotton), and men can buy the 100% polyester Adidas Men's Polo in black. With a presence in 120+ countries, Jockey is a leading underwear + apparel brand world over. Their t-shirt range in India is chic and affordable. 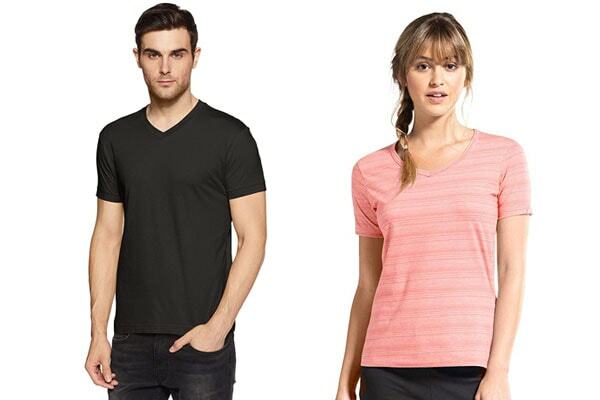 Men can get this Jockey Men's Cotton T-Shirt in any colour they choose, and women can opt for this pink cotton Jockey Women's Regular fit T-Shirt. Promoted by supermodel Gisele Bündchen back in 2007, Vero Moda is an internationally acclaimed Danish fashion brand, and also one of the best t shirt brands in India for women. Here's a 100% cotton VERO MODA Women's Graphic Print T-Shirt with graphic, grey text, short sleeves and a round neck. Another homegrown company owned by the Aditya Birla Group, Allen Solly is one of the best t shirt brands in India at par with international competitors. 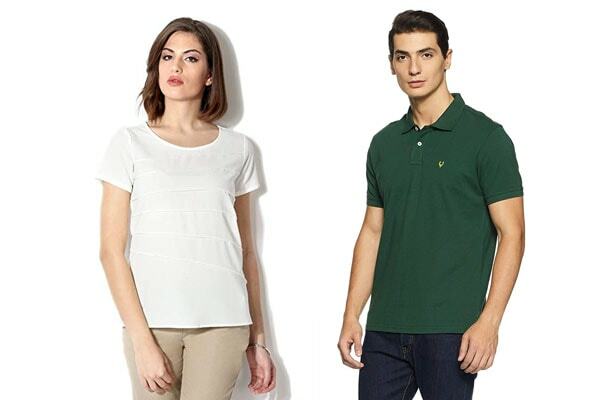 Men can go for this 60% cotton and 40% polyester Green Polo, and women can opt for this 100% Polyester pleated white tee. 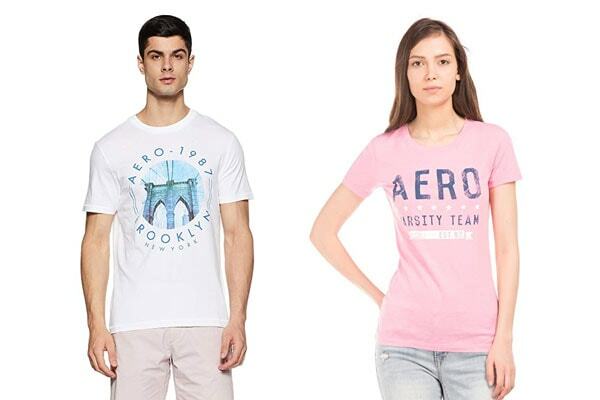 Aéropostale, Inc. (shortened to AERO) is an American casual apparel and accessories retailer and one of the best t shirt brands in India for young millennials. Men can opt for this 100% cotton Brooklyn Regular Printed T Shirt and women can get the 60% cotton Brand Print Slub T-Shirt in pink. Which according to you are the best t shirt brands in India? Tweet to us @HotDeals360 to submit your reviews. And don't forget to check out this list of the best sweatshirt brands in India.